An inexpensive solar water heater, that will help reduce fuel bills and can easily be installed in a family home, has been the focus of a University of Ulster student’s PhD research. Patrick Quinlan, who graduates today, has spent the past three and a half years developing the PRE-SOL Collector, which is an integrated collector storage solar water heater. “Solar water heating is a viable and effective way of reducing fossil fuel water heating. The PRE-SOL is a heating concept that delivers ‘simply sensible solar’ for the many who can’t afford or can’t accommodate a full sized solar water heating system,” explained Patrick, who is based at the School of the Built Environment on the Jordanstown campus. “The unique design of the heater unit has been conceived to minimise heat losses and optimise solar radiation collection. The low thermal capacity means rapid vaporisation and excellent thermal transfer. Combined with partial vacuum insulation technology, the design ensures prolonged hot water storage. “My particular role in the design development was in understanding and explaining the heat transfer and phase change mechanisms within the system. PRE-SOL is a method of pre-heating water for an existing heating system and can be easily retrofitted onto most types of domestic dwelling. 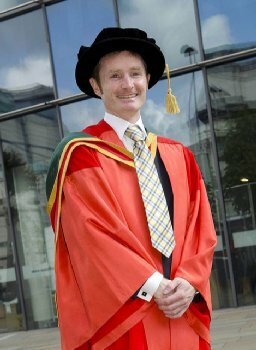 Patrick’s PhD research was funded by the Department of Education and Learning (DEL).